Chocolate whoopie pies are pillowy chocolate cakes filled with Bailey’s buttercream. They are a deliciously boozy treat for St. Patrick’s Day! Oh man, my baking with Bailey’s Irish cream is alive and well my friends. I have been brainstorming quite a few recipes using the Irish cream liqueur and they are going to be ah-maze-ing. First off, let me tell you about these Bailey’s chocolate whoopie pies. It’s been quite some time since I made whoopie pies (so long, the last batch were red, white and blue). So it’s about time I baked a batch and I couldn’t think of a better star ingredient than Bailey’s. Seriously though, the Irish cream liqueur is one of my favorite ingredients to bake with. It blends naturally with any chocolate dessert and adds a little kick with the alcohol content. When I decided to make chocolate whoopie pies, my natural instinct was to make a buttercream filling flavored with Bailey’s. You could say I had St. Patrick’s Day in mind, but honestly I just happen to have a bottle of the liqueur in my fridge waiting to be consumed. But before I go any further with my Bailey’s obsession, let me tell you about the chocolate whoopie pies. 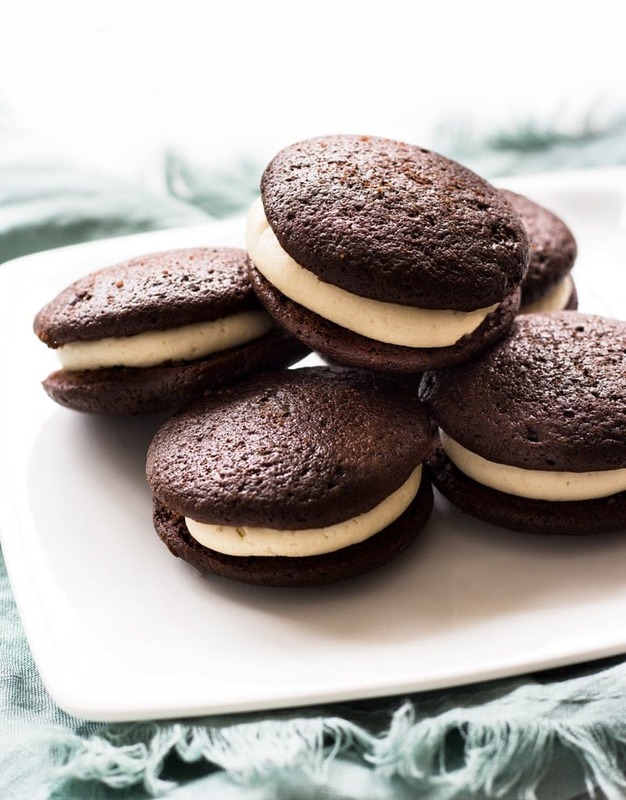 These whoopie pies are perfection—soft, pillowy clouds of chocolate perfection. Have you ever taken a cupcake, broken off the bottom and placed it on top to create a cupcake sandwich? That is what I picture when I eat whoopie pies. The chocolate cakes were made to sandwich the buttercream after all. Side note: if you haven’t tried that with a cupcake, do it. 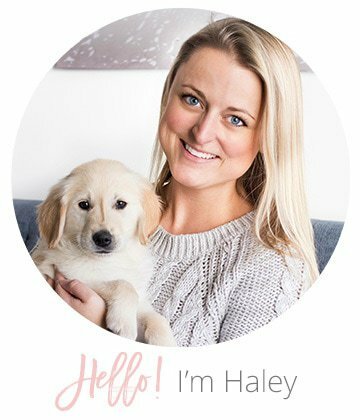 It will completely change your cupcake consuming experience. When I made the batter for the chocolate whoopie pies, I couldn’t help but include a teaspoon of espresso powder to enhance the chocolate flavor. It also doesn’t hurt that the subtle taste of coffee pairs perfectly with Bailey’s. 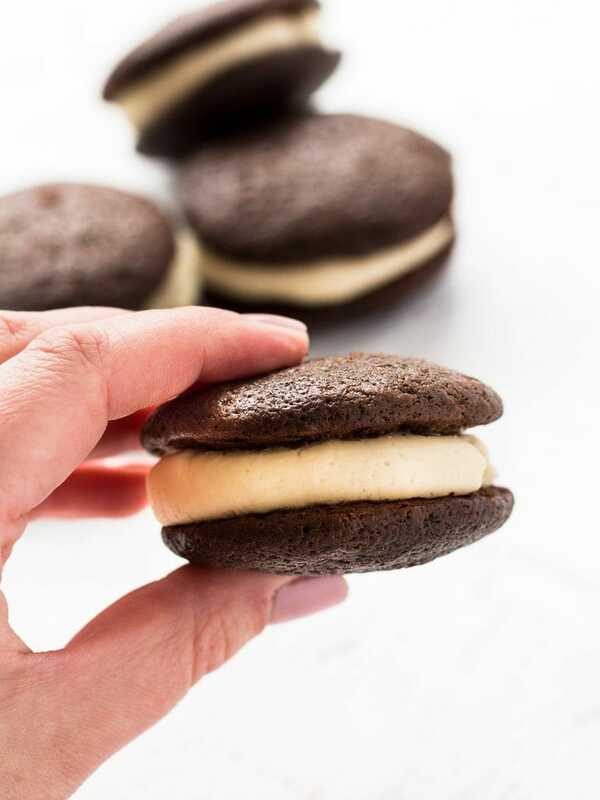 After all, the Bailey’s buttercream is the glue that holds these whoopie pies together. I used the same Bailey’s buttercream recipe that I did for my Irish car bomb cupcakes and simply piped a generous amount between two chocolate cakes. Biting into one of these chocolate whoopie pies gives you a flashback to your childhood (remember eating whoopie pies as a kid?) and then quickly takes you back to the present as the booze-infused buttercream hits your tastebuds. If you are looking for a St. Patrick’s Day dessert or are simply a lover of Irish cream liqueur like me, then try this recipe for Bailey’s chocolate whoopie pies. Either way you won’t be disappointed! In a medium bowl, whisk together the flour, cocoa, baking soda, espresso powder and salt. Set aside. In the bowl of a stand mixer (or using a hand mixer), cream together the butter and brown sugar, about 1 minute. Add the egg and vanilla extract and beat until light and creamy, about 2 minutes. Add dry ingredients to butter mixture in three parts, alternating with buttermilk (so add one third flour mixture, half cup buttermilk, another third flour mixture, half cup buttermilk and finish with remaining flour mixture). Combine well after each addition. Transfer batter to a frosting bag fitted with a round tip. * Pipe batter into circles two inches in diameter on the prepared baking sheet (each about three inches apart as they will spread slightly). Bake until tops are puffed and cakes spring back when touched, 10 to 12 minutes. Remove from oven and cool completely before filling. In a bowl with a mixer, cream together butter, Baileys, and powdered sugar. Spoon frosting into a pastry bag fitted with desired tip and pipe it generously on flat side of the cakes. Top filled half with another cake to sandwich the buttercream. Store in an airtight container at room temperature for up to 3 days. *Alternatively, you can spoon batter onto the cookie sheet and use the spoon (or your fingers) to shape them into circles. Chocolate whoopie pie recipe adapted from NYT Cooking. These are amazing!! My cookies baked in about 8 1/2 minutes but the recipe is perfect, I can’t wait to make these again. 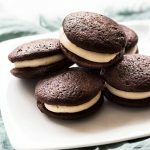 Do you have a whoopie pie recipe without chocolate? Hi Sara – Yes, unsweetened cocoa powder is used for this recipe.